Yes, I am a little behind in the series. The foundation to our new house was poured in late October, before the first hard frost hit. Building a home in the winter can be a little nerve racking in Minnesota because you never know when the ground is going to freeze or when the first big snow will fall. 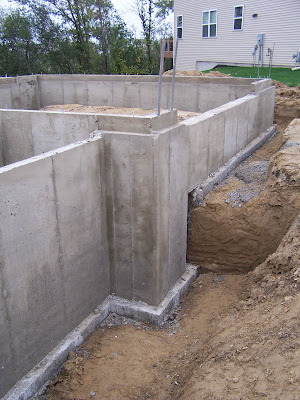 Since we actually have basements here in the Midwest, things like freeze depth have to be taken into consideration when building. Around the Twin Cities, the minimum foundation footing in most areas is 42 inches. This means that above 42 inches, the ground could freeze and cause damage to the foundation should you pour a footing for less. A good example to describe what happens is old home porches. If you have ever lived in an older home that has a front porch, at least in Minnesota, you might be sleeping soundly one night only to be woken up by some major creaking of your home. What is happening is the porch is actually moving because the footings usually only go down anywhere from 12-24 inches. When the ground freezes, these footings freeze as well, causing the porch to become fixed. When the ground thaws in the Spring, the porch is released from it’s winter hold and moves back to an original position. To alleviate this problem and create a stronger foundation, footings are now required to be at least 42 inches into the ground, the current accepted ground frost depth. If you build below the frozen ground in the winter, then you won’t have to worry about those late night creaks, or your porch separating from the rest of the house. If you want to learn more about the luxury side of real estate in Minneapolis, check out my other blog.